i LOVE everything about this outfit...you look great! and i love the hair down! Can I say how much I love this color combination? And you working that PMS Bloat…you’re too funny. Oh and love the hair! Nice color combination! The PMS bloat comment made me laugh! And I don't know what type of leaves those were (in my latest post). Anyways, love this! Very pretty! Super hot diva! I love the color combo....way to usher in summer!!! Everything about this outfit is CALIENTE! Love it ! Love it! Love it! lookin good. but u already know that! Nice color combination. And I want that orange blazer. Like now. These colors look so great on you, girl!! Rock it! Yesss Kiah, I am loving all of the color blocking its stunning! 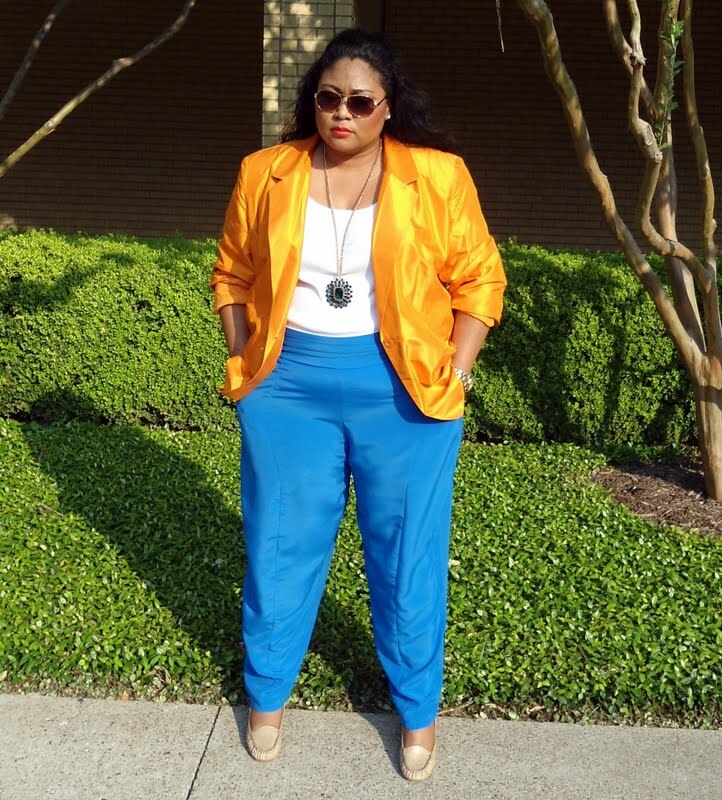 That orange blazer is a must have it brings so much life to that outfit! I love this colour combination!!! that's reminds me that I should dare more in my closet. it's just that neutral colours make me feel like I am in the 'safe side' but honestly, I am fed up with it! Anyway, I love your style darling!! You are fearless,Kiah. That is what I call colour blocking with panache. You look Fabulous! I love the color combo!!!! Very Nice! This is the perfect tone of blue that I adore.Great combo, you look awesome dear. Thank you all for the sweet comments. Oddly enough I just started wearing color. I used to be a total black girl...I am talking monochromatic black like Johnny Cash from head to toe! I NEVER wear my hair down!! It is so thick and it makes me extremely hot around my neck! I just cut off 5 or 6 inches about a month ago so it is not as heavy as it was but I really miss being able to wear my long side braid. I got all the dead ends off now so I will let it grow out again. Oh man I LOVE this outfit! the simplicity the colors everything is so amazing!!!!! That blazer is the best!!!!!!! I agree I love how we bloggers can admire each other. We are a community and it's awesome!!!! ummmmmmmm...kiah........... I LOVE THIS!!!!!!!!!!!!!!!!! That blazer is FIRE!!! You are soooo amazing!!!! My gosh, it should be illegal to look this good. I love your hair like this and your color contrasting skills are impeccable. You wear colours so well! 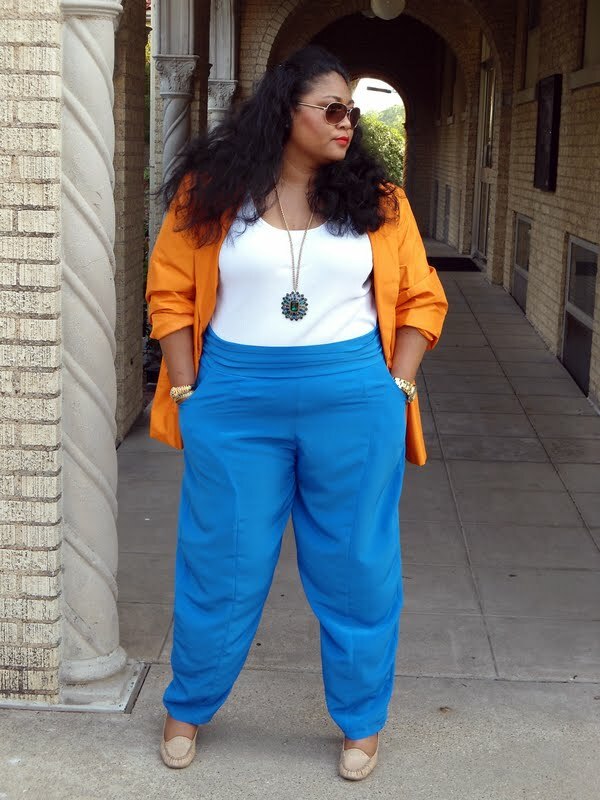 Kiah, You look absolutely amazing in these colors I love those pants I've been contemplating getting them too. They look fabulous on you! I love the colors, and lol at pms bloat you are hilarious! YOu look Fabulous! The blue and orange compliment and your hair is GORGEOUS!!! OMG..talk about the perfect Color Blocking outfit!! Well done lady. You look gorgeous. Uergh I so totally get the PMS bloat too, and also the morning-afternoon bloat. Anyways, you look fabulous, this is color blocking at it's best! the color blocking at its bests! I love how this looks on u, u r one foxy momma! LOVE IT! i GASPED when i saw this...i prob say that about all your posts, but i really did. GORGEOUS!!! its one of my favorite color combinations and you look so lovely in this. AH JUST STUMBLED ON YOUR BLOG AND EEEK YOURE SO FIERCE. I'm a HUUUUUGe lover of colours - so I obviously adore this looK! Awesome colour combo. It totally POPS. I loveeee it. 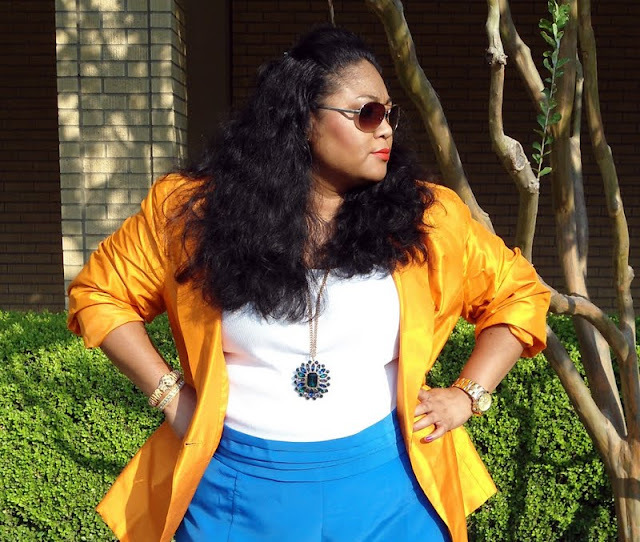 that orange silk blazer is to die for!! it's so amazing! also loving the combination with the beautiful trousers! oh oh oh ... please send this whole outfit to me !!!! the colors are poppping Diva,I love ur style so much Ms Kiah ! U blow my mind with your style. Seriously, this ensemble is on point. I love that your you, Nekiah. It transcends beyond the pictures. Je suis fan! I absolutely love this! love the colors! by far my favorite fit you have put up on your blog!!! those ASOS pants are soo dope and the blazer is AMAZING!! !